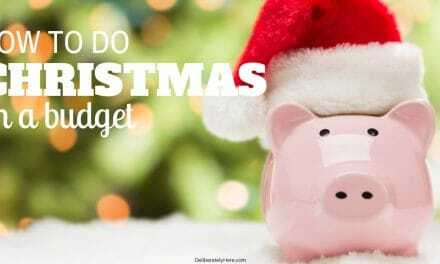 Have you ever seen a fantastic sale at the grocery store and thought to yourself, I wonder if I could freeze that. You want to stock up because of the good deal, but you know there’s no way you and your family would be able to eat it all before it went bad. 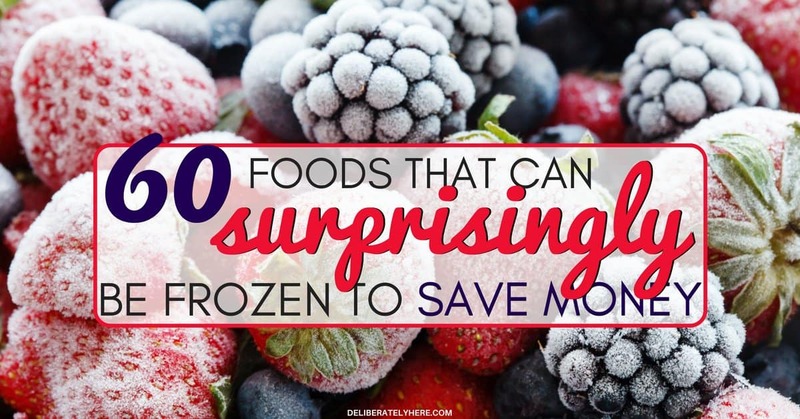 Here is a list of 60 surprising foods that can be frozen to save money on groceries. You may have ended up walking away from the sale, convincing yourself that there’s no way those eggs could be frozen and that they would definitely end up going bad before they got eaten. If you’ve ever found yourself in that situation, I have good news for you. The list of food items that can be frozen is surprisingly long – and yes, even eggs are on that list. If there has ever been a sale on milk that you had to pass up because you were afraid of creating chunky milk from freezing it, don’t worry – milk freezes incredibly well. Many people suggest emptying about a cup of milk from the jug before placing it in the freezer, to allow room for it to expand. When I buy several jugs of milk at a time I have never had problems with bringing the milk home from the store and placing it directly into the freezer, sealed and all. Though the milk jug does swell up a bit, I have never had a problem with a jug exploding or overflowing when freezing it without first removing any milk. If you want to be on the safe side, it wouldn’t hurt to take about 1 cup of milk out of the container before sticking it in the freezer, although I don’t believe it is absolutely necessary. I have a love-hate relationship with cheese. I love eating it, but I hate paying for it. Where I live, cheese prices are through the roof so anytime a good sale comes on, I stock up. When I say I stock up, I mean it. There is a good portion of our freezer that is dedicated to blocks of cheese because I don’t want to run out and have to go out and pay regular price for it. Cheese can become slightly crumbly after it has been frozen, so if that will annoy you a simple solution is to grate or slice your cheese before placing it in the freezer. 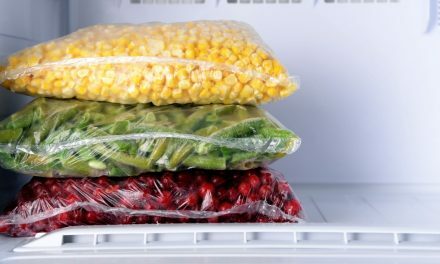 Some people even cut their cheese up and freeze it in portion-sized baggies to make it simple to grab a chunk of cheese for dinner and defrost it quickly. I don’t mind grating or slicing slightly crumbly cheese, so I usually just put whole blocks of cheese in our freezer. Though cream can be frozen, because it is so high in fat content, it will change the texture. It will still taste like cream, the texture will just become clumpy. Rather than using the cream that has been frozen in our coffees, I mostly freeze cream for later use in soups, sauces, and other baked dishes, as it doesn’t change the flavor at all. Just like liquid cream can be frozen, so can whipped cream. Put little dollops of the already-whipped cream onto a cookie sheet covered with parchment paper and put it in the freezer, once the whipped cream is solid, transfer them from the cookie sheet into a baggie to take up less space in the freezer. The reason that you want to freeze the whipped cream on cookie sheets first is that if you were to put it straight into the baggie you would end up having one big frozen ball of whipped cream. Freezing the whipped cream in little dollops makes it the perfect snack to grab out of the freezer and plop on top of a nice steaming cup of hot chocolate. As surprising as it may be, cottage cheese is also among the list of things that can be frozen. Though it may lose some of it’s flavor and acquire a slightly different texture after being frozen, it is still superb to use in cooked dishes like lasagna, soups, casseroles and sauces. Butter is one of the easiest things to freeze, as you can bring it straight home from the store and stick it directly into your freezer. It doesn’t have to be removed from it’s packaging or cut up or anything. Then, when you need more butter simply take the block out of the freezer and let it defrost on the counter or in the refrigerator (it goes pretty quickly), then cut chunks off to keep out of the fridge so you always have soft butter on hand, and keep the rest of the block of butter in the fridge so it doesn’t go bad and take it out as you need it. 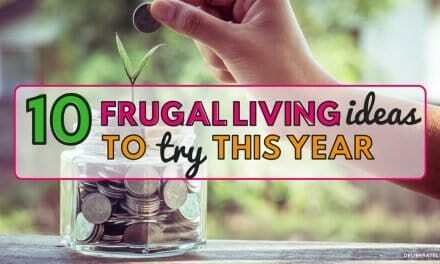 Since butter is like cheese where we live, it’s practically gold, I always and only buy it when it’s on sale – and a good sale doesn’t come around too often, so when it does I definitely stock up. Like butter, margarine can easily be frozen as well. 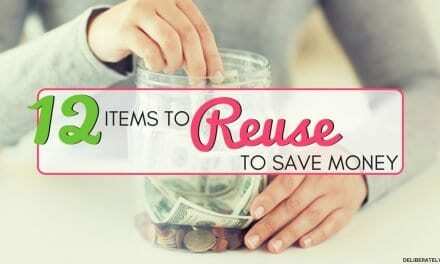 You can also bring it home and freeze it directly in its original packaging. Margarine isn’t terribly priced, so I don’t stock up on it too often, but every once in a while when a great sale comes on I will stock up to use it in some of my baking. I have also found that margarine defrosts incredibly fast. If I get the small containers, about 15 minutes after taking it out of the freezer I can already easily run a butter knife through it. I don’t know about you, but for me, buttermilk is one of those things that I don’t use a whole lot of, but sometimes a recipe calls for it and I end up with a carton of buttermilk in my fridge that is nearly full besides 2 tablespoons that I used in a recipe. Thankfully, buttermilk can be frozen and kept for a later date, although, if you mainly use buttermilk in baking and only use small portions at a time, I would dump it out of the carton and freeze it by the tablespoon or two in an ice cube tray so you don’t have to defrost the entire carton if you just need a small amount. Another alternative to buying buttermilk when you need it in recipes, and a much more common occurrence around our place, is to make homemade buttermilk. It’s simple and you most likely already have the ingredients on hand (it’s only two ingredients). To make homemade buttermilk, add 1 cup milk and 2 tablespoons of either lemon juice or white vinegar together, stir to combine, and there you go – your very own homemade buttermilk at a fraction of the cost, and you can adjust the amount that you make to work with the amount that your recipe calls for. Isn’t yogurt amazing? It’s healthy and delicious – though I’m sure some of you aren’t so hot about it. Yogurt is another one of those surprising foods that can be frozen that not many people think about. Like cream and cottage cheese, when yogurt is frozen then thawed it may separate and take on a watery consistency, but it is still good for you and you can still eat it by itself, add it into your favorite smoothie recipe, or eat it however you normally do. There’s a good chance you will eat your yogurt up before it starts to go bad anyway, since it generally stays good well past its “best by” date, but in the case that you have an overabundance of yogurt on hand or just know you won’t be able to eat it before it starts to mold, you will definitely want to stick it in your freezer to prolong it’s life. Cream cheese is something we don’t use very often, but I always like to have on hand in case we ever need it, so, even though cream cheese already has a very long lifetime, I like to extend it by freezing it because sometimes I just know it’s going to start to mold if I leave it in the fridge. With cream cheese on the list of foods that can be frozen, it’s important to note that, like many of the other dairy products mentioned, it will likely change consistency after it has been frozen, though it will still taste great. Cream cheese that can be frozen is often a lot more crumbly and not so creamy. The best that I have found for frozen cream cheese are on homemade bruschetta – though it’s a bit crumbly to spread onto the bread it still tastes great, – in pasta sauces and casseroles. So go ahead, if cream cheese is something you often find yourself using, stock up when a sale comes on a throw those packets into the freezer. When frozen sour cream thaws it takes on a clumpy texture and isn’t quite so pleasing to the eye, though it is still perfectly fine and tastes good. If consistency and aesthetics don’t bother you, then go ahead and use sour cream that has been frozen for your chip dip, but if you tend to get grossed out when things that aren’t necessarily supposed to be clumpy end up being clumpy you might want to stick with using your frozen sour cream in cooking and baking where you won’t even be able to notice the difference in it. 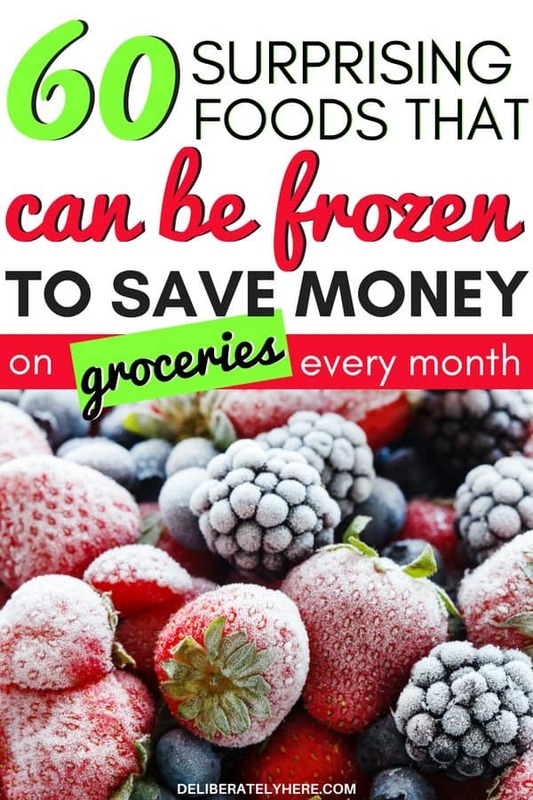 Click on the next page to discover more foods that can be frozen!